I got nominated for another award! This time it’s for Dragon’s Loyalty Award. 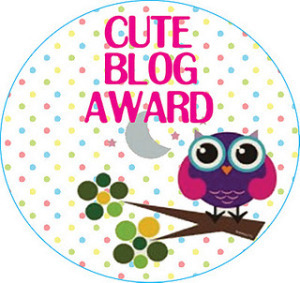 I was nominated by fellow blogger and reader of this blog, Glynis!! 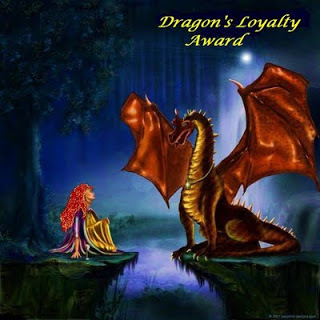 Which according to her, the Dragon’s Loyalty Award is a combination of both The Versatile Blogger Award and The Very Inspiring Blog Award. I honestly think that is the coolest thing ever! I follow her on Twitter and her blog and I love her posts, poems and she does almost the same of the writing challenges as me. I am very happy and honored she included me to be nominated for this award. So thank you again dear! I have to amend these rules, because those I follow didn’t accept awards or have so many they don’t need or want any more. Plus what 7 things about me will interest anyone. 1. I have 11 drawings I’ve made from 2010-2012 and they were all done with my feet. 2. I have read over 40+ books since high school and I think I’ve only hated three and funny enough, I read (or tried to read) those books after I graduated from high school. 3. My favorite decades are 1920-40s, but I also have a obsession with the 1700s and 1800s too. 4. I love to recycle things like wipe boxes, and reuse them to store little things like hair bows, cords, and etc. I haven’t done it long and it’s still a mystery of how it got started, because nobody in my family recycles anything except maybe water bottles. 5. Whenever I had/have a crush on someone, if they are single, they usually get put on my infamous list of wishful “loves” but once I found out they have a girlfriend or a wife. They get taken off the list rather quickly and thats celebrities included too. 6. I did NOT like Fifty Shades Of Grey series, but I think I will watch the first movie to just watch it. Well that’s it! Now back to your local reading! Thank you so much for passing this award forward, what a lovely way to finish 2013 🙂 I loved reading the 7 facts about you and will try hard to think of some about me…. that’s the tough side of receiving awards! I would love to see some of your artwork.